I was doing some research today and found across a very interesting article that Blooloop did with some of the Walt Disney World team. This interview was all about the various upcoming nighttime spectacular and featured a lot of information that I haven’t yet seen, as well as confirmed some rumors that I had. I knew if it was news to me, it would likely be news to you too! First, let’s start with the show that’s debuting first. The Wonderful World of Animation will be starting on May 1 at Disney’s Hollywood Studios. This show will be a laser light and projection show, which will also feature special effects and a few fireworks, will use state-of-the-art lighting technology to showcase images on Grauman’s Chinese Theatre and will take Guests on a visual journey through more than 90 years of Disney animation. According to the article, the show will be 12 minutes long and will feature nods to every single animated release by Disney and Pixar. According to Ray Coble with Disney Parks Live Entertainment “A new soundtrack is about to be recorded for “Wonderful World of Animation.” Also, in the future, Disney hopes to be able to add new Disney and Pixar films to the show as they are released into theatres. The big news though, is that the show isn’t a replacement for the current shows that are already taking place at Disney’s Hollywood Studios, which are Disney Movie Magic and Star Wars: A Galactic Spectacular. In fact, depending on park hours, all three shows could play each night. Speculation had been running rampant that this show would replace one or both, so that rumor can now be put to rest. The four-minute “Awakenings: Lion King” projection show will run multiple times nightly through September 30. Let’s move over to Epcot, which will be adding two nighttime spectaculars soon. First will be the new “Epcot Forever” show which begins a limited-time run immediately after the original Illuminations says farewell later this fall. “Epcot Forever” will celebrate the 37-year history of the park with fireworks, lasers and lighting effects set to a soundtrack of familiar Epcot songs. The show will include special effects-enabled kites that are capable of airborne choreography – a first for an Epcot nighttime entertainment show. The illuminated kites will be controlled by two-man teams aboard Jet Ski-like personal watercraft. The show will employ eight of the Jet Skis, with a driver and kite performer aboard each personal watercraft. The movement of the Jet Skis will also create the wind required to keep the kites aloft. The music featured in Epcot Forever will feature some of your favorite Epcot songs, past and present. 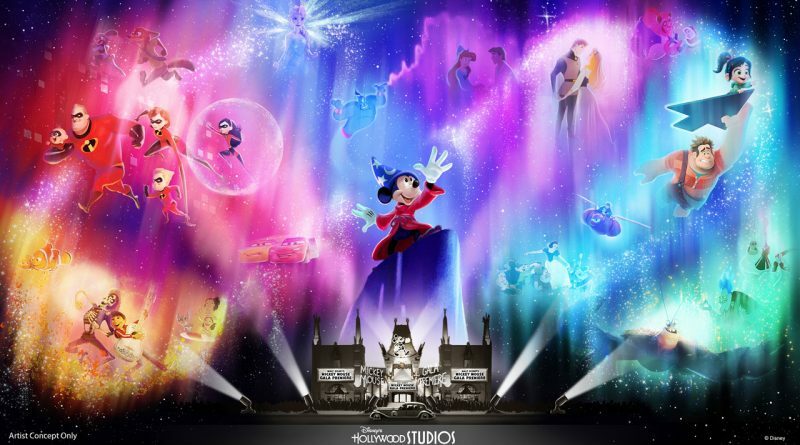 The new permanent show, which will debut sometime in 2020 will celebrate how Disney music inspires people around the globe. The fireworks and laser show will feature massive floating set pieces, LED panels and choreographed fountain displays. The show will raise the bar for Disney spectaculars. So many exciting things are happening with the nighttime spectaculars at Walt Disney World! Which one are you looking forward to the most?